Lemi Shine is magical. We must have the hardest water ever. Any harder and I’d be able to walk on it. Our dishes had the grossest white film on it that just kept getting thicker and grittier and grosser. I thought we were going to have to wash dishes by hand or buy new dishes. Then we tried adding Lemi Shine. No joke, after 2 or 3 cycles, the dishes look like new. I wish I had before and after pictures. Imagine an opaque drinking glass next to a crystal clear drinking glass. Actually, the picture on the bottle could have been taken in our kitchen. So I wanted to know what voodoo powder is in Lemi Shine that allows for such magical transformations to happen. Looking on the innertubes, people making home-made dishwasing detergent often have a line like ‘add Lemi Shine or lemon Kool-Aid packets.’ So that’s weird. The label on the bottle says it contains ‘natural fruit acids and citric oils.’ Ok, so maybe the lemon Kool-Aid isn’t so weird. Here’s a list of natural fruit acids. So I guess since I’m a chemist, I should bring some into lab and figure it out myself, eh? So I did. 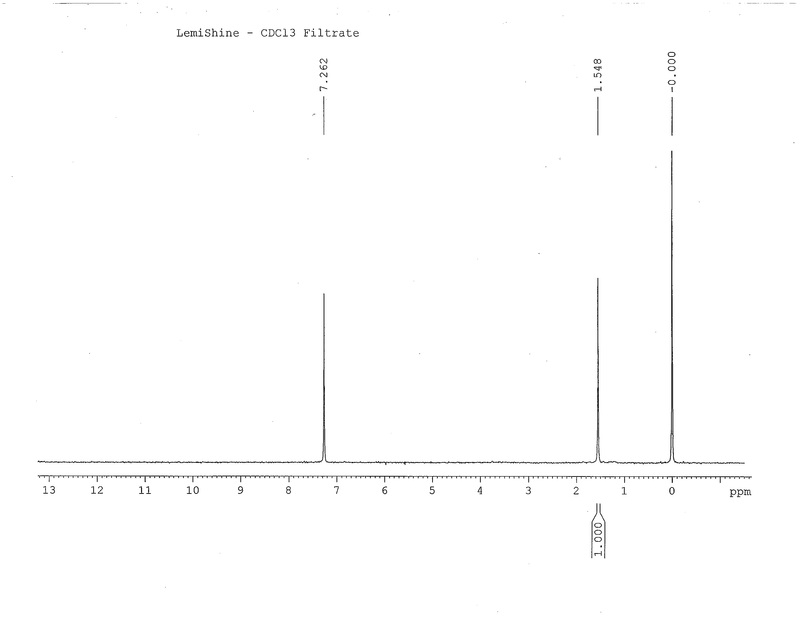 About this time, @DrBodwin suggested I run a GC/MS on the filtrate from the dichloromethane solubility test. The entire granule may not have dissolved, but maybe some trace organics did. 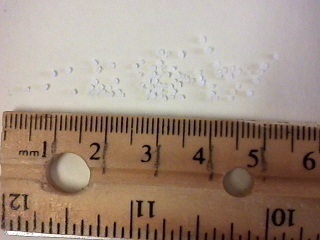 Also about this time, I noticed the ethyl acetate getting cloudy just above the granules. 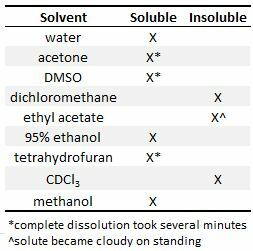 So I prepped GC/MS samples of the Lemi Shine completely dissolved in methanol, and the filtrate from the dichloromethane and ethyl acetate solubility tests. 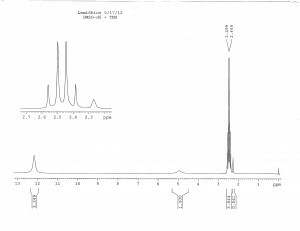 I had a guess going into the GC/MS based on online discussions, but my guess was not confirmed through GC/MS. Sources (read: wikipedia) said my guess decomposes above 175 degC, so that may explain why it didn’t show up on GC/MS. 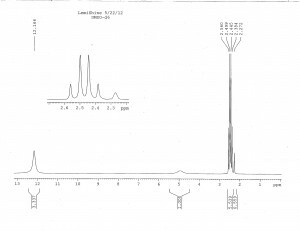 An LC/MS would perhaps give me more information, but we don’t have a walk-up LC/MS. 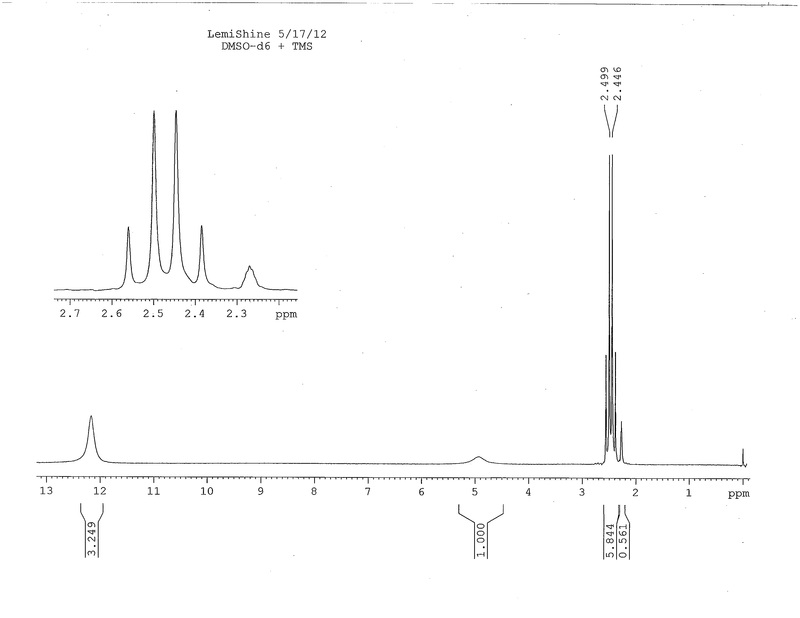 @stuartcantrill noted that the residual proteosolvent peak for DMSO (which appears around 2.5 ppm) should have 5 lines, not four. 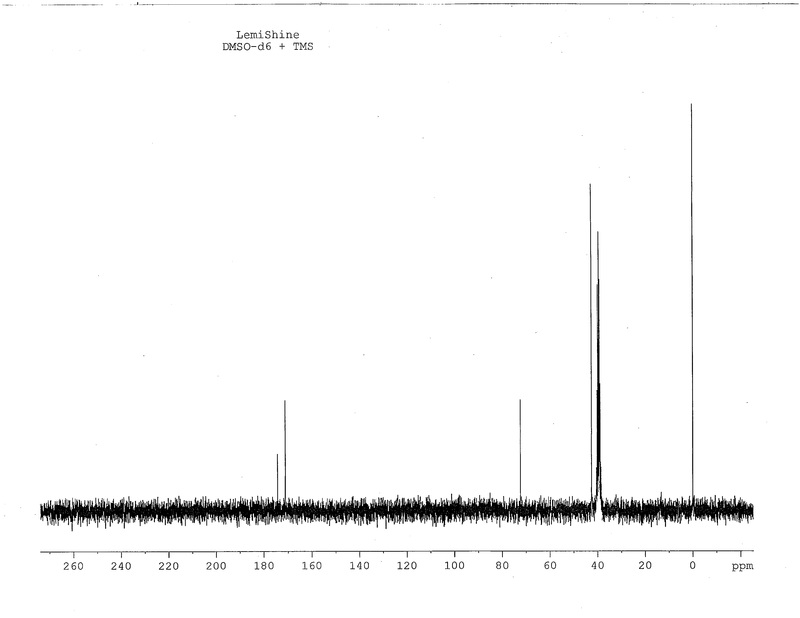 But I think the apparent quartet is a real signal from the Lemi Shine, not the solvent peak. They just happen to appear in the same area and thus overlap. 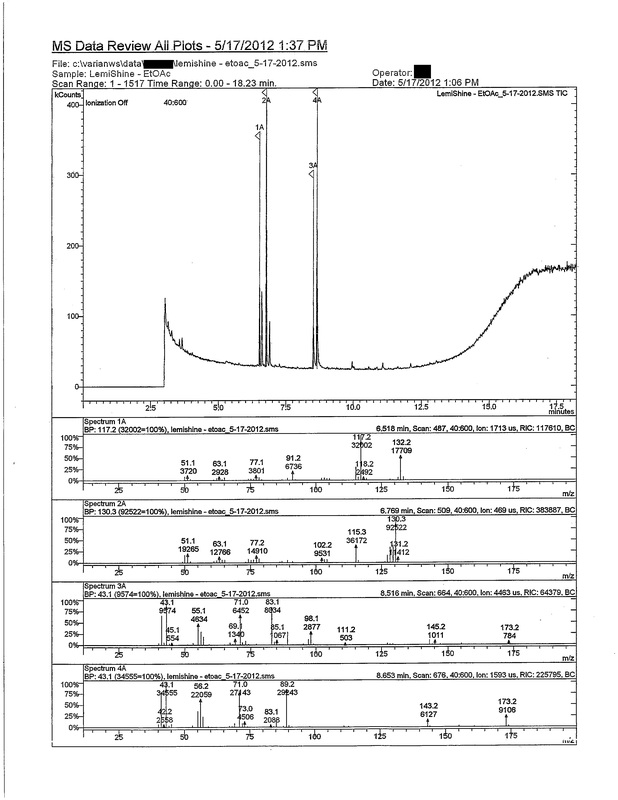 It really is noteworthy how clean the DMSO NMR is. 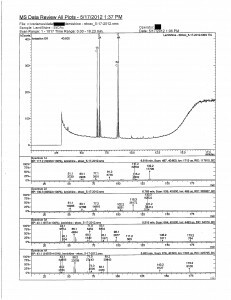 Chemists often lament the trace residual ethyl acetate or dichloromethane contaminating their NMR spectra during synthesis. The flat baseline indicates Lemi Shine has one major component and if there’s anything else, it really must be closer to 1%. The HNMR and CNMR confirmed my initial guess as to the identity of the major component of Lemi Shine. I’ll summarize the data here, then I’ll hide my guess below if you want to comb through the data and decide for yourself first. My guess is based on many online diy dishwashing detergent sites saying you can buy Lemi Shine or straight citric acid. 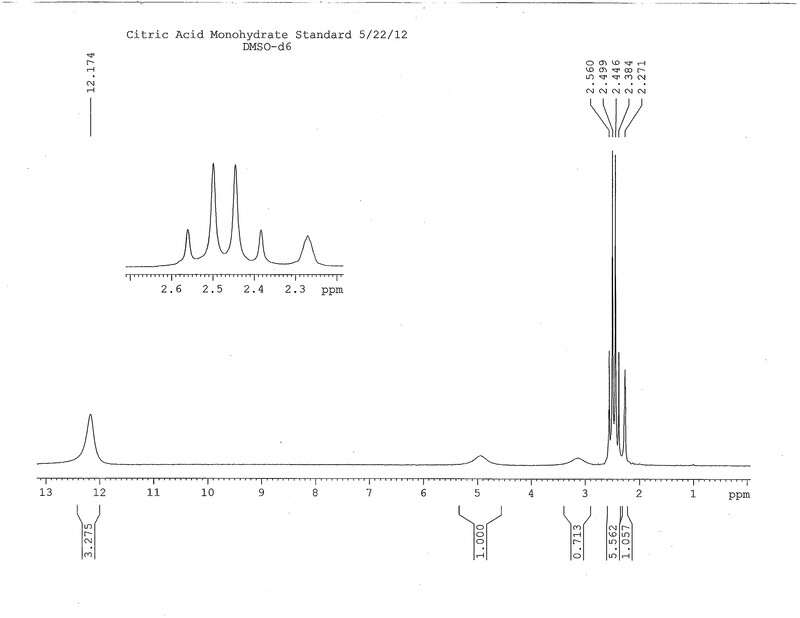 Also, Sigma-Aldrich’s entry for citric acid lists a mp of 153-159 degC, and has a reference NMR. 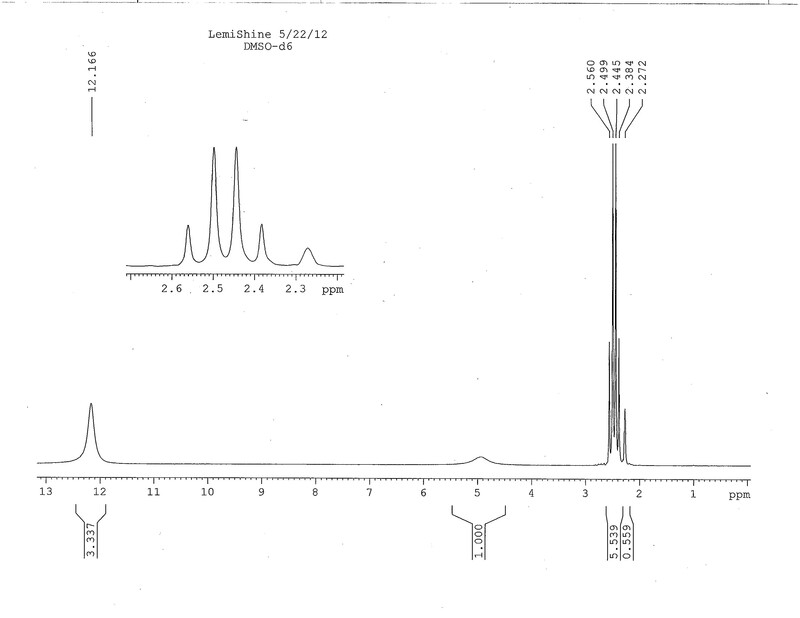 The NMR matches perfectly. My first instinct was: they’re lying. And I told them so (nicely). But it bugged me for the rest of the night. If it’s really not citric acid, what is it? A citrate salt like sodium citrate might still make sense. Could explain GC/MS data. But would it give pH ~2? Certainly not sodium citrate tribasic. But maybe sodium citrate monobasic could turn my pH paper red. But CNMR would look the same, too. But integration in HNMR would be off. There’d only be a 2:1 ratio of acid:alcohol protons. Not that broad singlet integration is an exact measurement, but I’d expect it to be a bit closer to 2:1 not 3:1. Maybe they were just being cute. In 140 characters, I only said it was citric acid. There are probably some trace fragrant oils or something to give the 1-5%, so perhaps I was wrong because I wasn’t technically right? Someone on Twitter suggested polycitric acid (though I can’t find the original tweet anymore). That could certainly make a lot of sense. Only spectra I’d expect to be different would be peak heights in HNMR and/or CNMR. Some protons are going to be lost in polymerization, and if it was polymerized through ester bonds, there’d presumably be some linker with protons and/or carbons of it’s own, yes? Brandon suggests a ninhydrin test for the ammonium cation to see if Lemi Shine is an ammonium salt. Ninhydrin is one of the chemicals used in forensic development of fingerprints and reacts with nitrogen to create a red/purple color. So I spotted Lemi Shine on a TLC plate and dipped it into a ninhydrin stain. Even after heating, the TLC plate showed no evidence of nitrogen. Stewie Griffin also suggested a test for the ammonium cation. He suggested the USP test. Since I teach at an R7 school, I was quite surprised we actually had all the reagents necessary for the USP test. So I did as Stewie suggested and bubbled through the indicator solution – didn’t turn yellow. I also added the cobalt reagent – didn’t give yellow precipitate. I’m confident with these two tests to say Lemi Shine is not an ammonium salt. Trent Wallis suggested a quick, even microscale, titration for more accurate data. If I’m going to get some data, I’m going to try to get it right, so a ‘quick and dirty’ titration isn’t in my bones 🙂 So I reached waaaaay back to remember how to do titrations. Something about a buret. Make sure the stopcock’s closed. Oh yeah, I guess I should standardize the NaOH. While I didn’t standardize in triplicate, I calculated my solution of NaOH to be 0.0942 M.
Then I titrated 0.2278 g Lemi Shine in 30 mL H2O with this 0.0942 M NaOH. After every 0.1 mL, I measured the pH and recorded it in Excel. 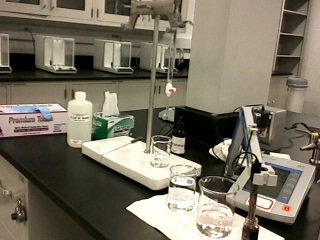 After 19 mL, I realized this was very very tedious, so I measured the pH every 0.2 mL. At 33 mL NaOH, the pH started rising more rapidly, indicating I was approaching the endpoint, so I went back to measuring the pH every 0.1 mL. The endpoint came around 36.1 mL 0.0942 M NaOH. I finished out the 50 mL buret for completeness’s sake. 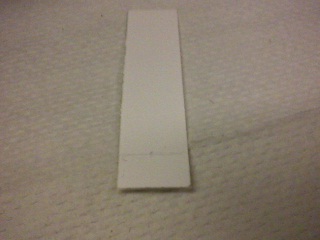 Here’s my titration curve. Source data available upon request. 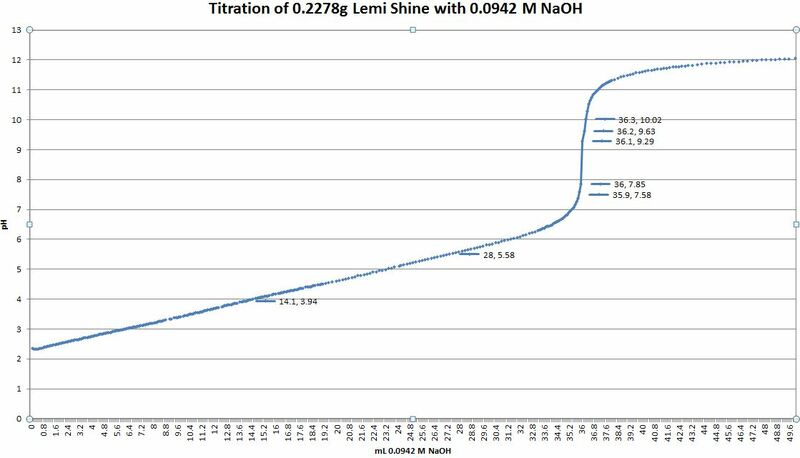 The exact pH of the Lemi Shine (0.2278 g in 30 mL H2O) before titration was 2.3. 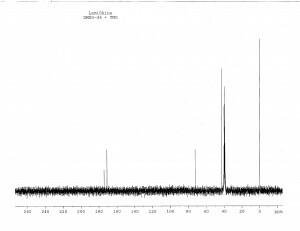 If we take the equivalence point to be 36.1 mL (0.0034 mol NaOH @ 0.0942 M), then the equivalent weight of the acid is (0.2278 g/0.0034 mol) = 66.99 g/mol. Assuming it’s a triprotic acid (based only on the titration data, an invalid assumption), that would give the molecular weight of the acid to be 200.97 g/mol. The molecular weight of citric acid is 192.124 g/mol. More on that discrepancy later. Mitch said I should just taste it and be done. No. TSvn suggested adding Lemi Shine to acetic anhydride in pyridine. If it’s citric acid, the solution should turn red. So I did. And it did! Further evidence for some sort of citric acid? Note how the AB system for the diastereotopic methylene protons completely overlap, with no shoulders or splitting, etc. I’m convinced it’s citric acid, not some salt of citric acid. Now, about that pesky titration data. Let’s assume it’s citric acid. The molarity of 0.2278 g citric acid in 30 mL would be 0.03952 M. Different websites have different pKa values for citric acid, an average of 7 of them gives a pKa of 3.122. That’s a dissociation constant for citric acid of 0.0007553. Thus the pH of a 0.03952 M solution of citric acid would be… 2.3, exactly the pH I noted for my sample. But if the endpoint is at 36.1 mL of 0.0942 M NaOH, that gives an equivalent weight of the acid to be 66.99, which would correspond to the molecular weight of a triprotic acid of 200.963 g/mol. This is 8.839 g/mol greater than citric acid (192.124 g/mol). If we assume citric acid, we essentially have zero unknowns in our equations, so we can check the values against each other by asking ourselves GenChem questions. 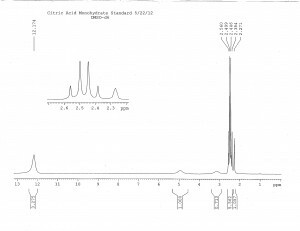 How many mL of 0.0942 M NaOH are required to completely react with 0.2278 g citric acid? With a 3:1 stoichiometry, the equivalence point should have occurred at 37.8 mL. That’s a difference of 1.7 mL – that’s a lot of mL. So, if I’m pretty sure it’s not a citrate salt (the pH wouldn’t have been 2.3 for a citrate salt anyway), maybe it’s a hydrate of citric acid? If that were the case, then I wouldn’t really be titrating 0.2278 g citric aicd. For the monohydrate (MW = 210.14 g/mol), the mass fraction of citric acid is 91.43%. So a 0.2278 g sample of the monohydrate would really be 0.2083 g citric acid. How many mL NaOH would I need then? 34.5. Now I’m off by 1.6 mL in the other direction. My endpoint was between the anhydrous and the monohydrate… what if it’s the hemihydrate? The mass fraction of the hemihydrate (MW = 201.133 g/mol) would be 95.52%, so a 0.2278 g sample would be 0.2176 g citric acid. How many mL NaOH would I need then? Why 36.07 mL! If the equivalent weight was 66.99, and the MW would be 200.96 g/mol, that’s 0.2 g/mol off the MW of the hemihydrate (201.133 g/mol). So! My ultimate final guess is citric acid hemihydrate. I think I’m done testing Lemi Shine. So if someone else wants to run other tests, be my guess. Just be sure to post your results here so we can know! I would think they’re using a dihydrogen citric salt, perhaps a calcium or ammonium variety (to help solubilize whatever anions may be floating around). 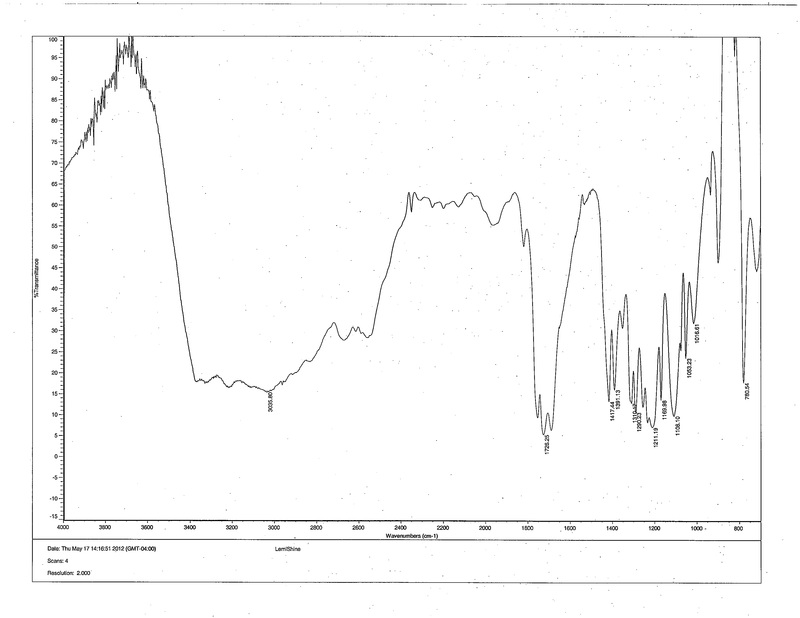 The SDBS version of ammonium dihydrogen citrate (in KBr) looks pretty close, especially in the 1600 region. For comparsion, citric acid under the same conditions. Only two peaks ~1650, no absorption around 2000. Oh, and a ninhydrin test would nail down the presence of an amine. I don’t know what you do if it was an inorganic cation though. Flame test? Maybe toss in some sodium phosphate to make an insoluble salt? 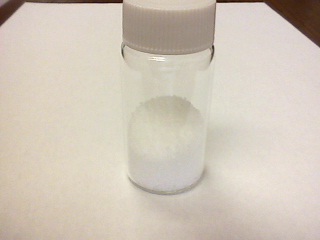 Ammonium— Add 0.2 g of magnesium oxide to the solution under test. Pass a current of air through the mixture, and direct the gas that escapes to just beneath the surface of an indicator solution, prepared by mixing 1 mL of 0.1 M hydrochloric acid and 0.05 mL of methyl red TS 2. In the presence of ammonium, the color of the indicator solution is changed to yellow. 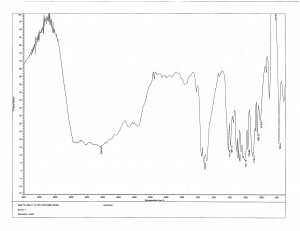 After directing the gas into the indicator solution for a sufficient period of time, add 1 mL of freshly prepared sodium cobaltinitrite TS to the indicator solution. Upon the addition of the sodium cobaltinitrite TS, a yellow precipitate is formed when ammonium is present. A quick titration (even microscale) against hydroxide or more accurate pH measurement would really nail down the molar mass per acidic proton. Could the complication be that it’s the monohydrate? Also, for a quick and nasty ammonium ion test just add hydroxide then heat gently and smell for ammonia. K will give a precipitate with cold perchlorate; Na is trickier, but uranyl zinc acetate is the reagent of choice. Just taste it and be done with it. This is so cool ! I am a new reader, and a chemistry student – love to see chemistry in action! Great article, look forward to more. 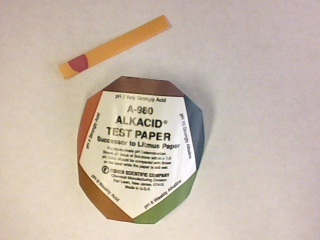 Try with this: add about 5 mg of you sample to a mixture of 1 ml of acetic anhydride and 3 ml of pyridine. 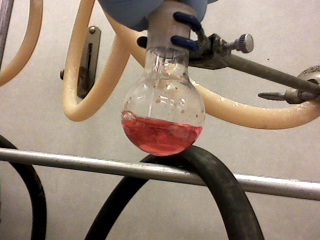 A red colour should develops (if citric acid is present). Also, what kind of GCMS machine did you use? How did you programe look? What were the settings? 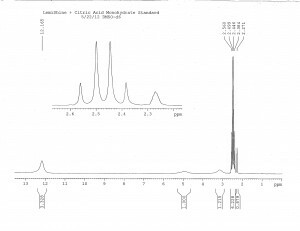 The proton and carbon NMR spectra are of citric acid; students in my NMR course have assigned these for the past 10+ years. The apparent quartet you mention is an AB pattern for the diastereotopic methylene protons. Put a fork in this problem…you are done. Citric acid makes sense. 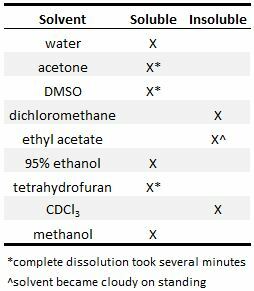 ESI-MS may be easy to do since it dissolves in ethanol or methanol. That should nail the MW. Citric acid is also used to remove stains that form on fiber glass swimming pools. Pool warehouses sell the stuff for 5-10 times what you’d pay at Aldrich, but then you can’t buy it at Aldrich if you’re not a chemist. If you want to check to see if its a salt, do a flame test. A company is likely to use something obvious like sodium or potassium because they’d be cheap. PS. That also means you can use it to clean your coffee maker. Do you have that much faith in your analysis? Perhaps some people would be wary about the citrus scent in their coffee maker. 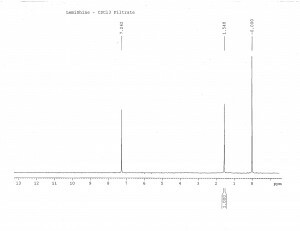 Various ratios of citric, oxallic, phosphoric and succinic (sp.) acids are common in coffee maker cleaners depending on regional prices and regulations. Citric acid is becoming a go to acid in consumer cleaning products as more of the inorganic acids keep getting shoved onto various not desirable lists. Ugh. Instruments folks, they are called instruments. 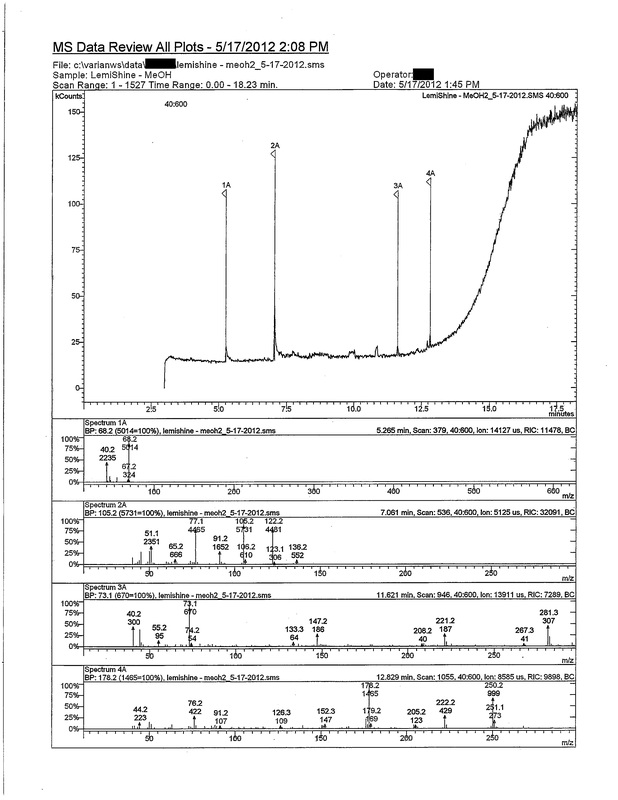 I am interested in the chromatographic parameters. What column did you use and how was your ms setup? If you want I can try and find some LemiShine and try to get an LC-MS next time I’m on one at work. Generally I can do both ESI and APCI in positive and negative detection modes. Also scintillation vials are so win! 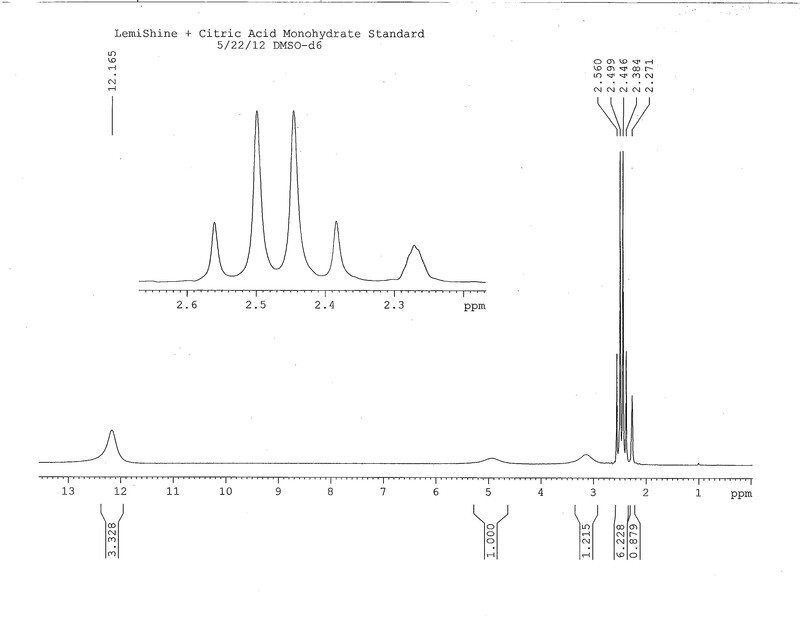 Run an NMR of citric acid and an NMR of Lemishine. 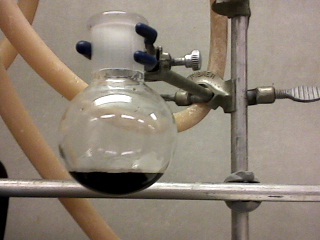 Then mix the two tubes and run an NMR of the mixture. If the NMRs are all identical, then the compound in solution is the same compound. Can someone get an EDAX of this stuff, so we can find out if they are using a salt? No need to go rush out and buy citric acid to replace your Lemishine. The price of the food-grade acid is about the same as Lemishine off the grocery shelf. And it has that yummy lemon smell. Thank you. This brought me to the whole POINT, in my opinion!!!! Lovely, lovely demonstration of chemistry in applied time wasting 😉 Seriously though, I love this account. You say that as if it’s a bad thing! I’ve never had a dishwasher (most houses in the UK don’t have them) – washing by hand is quick, uses less water and uses no electricity (obviously). Admittedly, I live in a household of only two people, so if you have a large family, I can understand that doing it by hand would be a huge hassle. If there’s only a couple of you, though? By hand is the way to go. 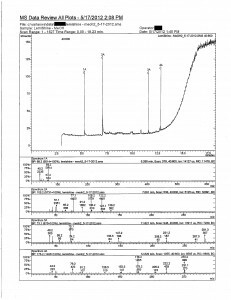 Azmanam and others, sorry about the citric acid titration curve not displaying – titration info site is protected against hot linking. To see the curve you have to visit http://www.titrations.info/acid-base-titration-polyprotics-and-mixtures (third plot form the top – refresh the page if it still displays titration info graphics from your cache). Feel free to copy the plot to chemistry-blog site and to serve it from here. The water in Clearwater is anything but clear…I’ve used Lemi-shine before–but wondered about the chems –human body not meant to absorb them…Year ago when I owned a hair salon we use to use Vinegar to clarify hairspray buildup off the hair…So I added a cup of white vinegar in rinse –it removed the cloud film and glasses and dishes are sparkling again. TSvn has a good point. We regularly derivatize large/polyfunctional acids and alcohols to get them volatile enough for GC/MS. Methyl ester derivatization of acids is pretty common too. I cannot tell you how incredible everyone findings are. I have one real question? Can you consume Lemi Shine in small amounts? Mixed melting point tests should distinguish it from citric acid or its hydrates. Azmanam – kudos to you. This post makes me want to be a chemist! I’m good at tinkering however. Lemi-Shine worked OK for me, but not great. So I developed a competitor & I think it works even better. Happy to send you a sample if you want to test it! Search for CitriClean of Florida. Came accross your blog here by accident. After seeing what Lemishine did to a few items in my dishwasher, I was looking for something less strong. It took all the print off 2 pyrex measuring cups as well as the finish on an enamel baking sheet. Your experience with the pyrex container and enamel reminds me of my wife’s experience of using toilet bowl cleaner [hydrochloric acid?] to clean rust out of our old, iron bathtub. It removed the enamel so that the metal underneath could rust better. So, do you have any suggestions for a homemade lemi shine? I wanted to thank the original author and all his associates (those who suggested and performed tests) for this experiment. I’m nowhere near being a chemist but I enjoy science, DIY, and green living. These tests give me enough confidence to add this ingredient in my homemade cleaners. Over the five years we have lived in this particular house in Lanark County, I have used vinegar, rinse additives,etc with some good success. This last fall and winter however, proved very challenging without any of the above improving the film on our glasses. I came acrosse Lemi-Shine by accident and have been very pleased with the results. A Citric Acid base sounds pretty solid to me… I was a storeskeeper in Chemistry dept @ Queens. Anyway, I plan on keeping up with it. EXCELLENT PRODUCT. I tried scrubbing a cookiesheet with baking soda and water, and when that wasn’t working well enough I sprinkled Lemi-Shine on it as well. It bubbled like crazy. I rinsed that off and did just Lemi-Shine and water, but it didn’t bubble at all. SO…does citric acid react with baking soda? I can tell you that with my amaaaaazing sniffer, there definitely is some sort of fragrance added to lemon shine. I have both lemon shine and citric acid and they don’t smell the same. I see this problem with dishes several times a DAY! most of the problem is the dishwashing detergent left on glasses ever since they took the key ingredient out to help save our rivers and streams by the way dishwashing detergent is poison now LOL Im no chemist but read the box or bottle I tell cust to use vinegar instead of any so called detergents that simply do not work remember a dishwashers is more a rinser then washer it also works for your clothing its safe and good for you cheap etc you cant beat it! Would you use vinegar along with detergent to wash clothes? How much vinegar for a dishwasher to wash dishes? This is awesome. I’m a nurse and have been for 20 years so I don’t underatand 3/4 of what you said but I loved it! I’m with you and think it’s citric acid. HOWEVER, I’ve used citric acid in my dishwasher with DIY dishwasher soap and they still came out filmy. Even with a vinegar rinse. I’m still on the hunt! Keep up the awesome work! Hi, I do baking soda+washing soda+sea salt pre-wash and lemi shine main wash and vinegar rinse. Once citric acid from amazon arrives I’m gonna test it out in main wash compartment. If it doesn’t shine like with lemi shine, I will add lemon essential oil in it and see how it turns out. Hope this helps. We have super hard water here in CA. In TX I only had to use the finish orange tablets (liquid) for main wash that’s it. With lemi wash (or citric acid I guess) u gotta use powder form main detergent for best result (so it states on the lemi shine container). Sorry I meant “with lemi shine (or citric acid) in main compartment, u must use powder form detergent for pre-wash for best result” as stated on the lemi shine container. Anyway after I put the dish washing detergent (homemade) in pre-wash and lemi shine in main wash, vinegar in rinse compartment, it really worked. Hopefully it’ll work just as great with straight citric acid. When I have run out of lemishine, I use citric acid that I got at Sprouts. It works the same. Not that this is a scientific statement or anything, but…. I’ve often wondered if it was dehydrated lemon juice. With similar benefits all around in dealing with hard water scale. My son got into the LemiShine when he was 2 and I called the number on the container right away. They told me that it was fine to ingest and that’s it’s just citric acid. At least that’s how I remember the conversation… that was a few years ago now. I know I didn’t make a follow up call to poison control or anything. My guess is it contains phosphates of some kind. I’ve been doing extensive research on dishwasher detergent and why it doesn’t clean the dishes and leaves them cloudy and every where I look, it leads back to sodium phosphates. Phosphates became illegal to put in dishwasher detergent and laundry detergents with the exception of industrial use. So, if you want a dishwasher detergent that REALLY works, either go to a restaurant supply and buy some industrial dishwasher detergent or go online and buy some Sodium Tripolyphosphate and add it to your current dishwasher detergent. However, I must say – I used to have soft water, but my softener broke and I haven’t had the finances to either get it fixed or buy another one. Ever since then, my dishes come out still dirty and VERY cloudy. I have tried every consumer brand under the sun and NOTHING worked! I even did the home-made thing and was sorely disappointed. I was so angry at having to re-wash all of my dishes by hand that for 2 years I just stopped using my dishwasher altogether. Then I was at WalMart a few months ago and Lemi-Shine had a sample pack for $2 and I thought what the hell! I haven’t tried this yet and if it doesn’t work, they guarantee my money back. I was FLOORED! First time and Lemi-Shine got my dishes clean and without leaving that nasty cloudy film!!! Lemi-Shine is the ONLY dishwasher detergent that woks for me. And I haven’t had to add any Sodium Tripolyphosphates! I just might use the Sodium Tripolyphosphate for my laundry! I have a ‘liberated’ bottle of citric acid here at strangulensis Manor but, if I didn’t, I’d head for the cheap lemon juice store since buying citric acid sounds really expensive from a chemical supply house, drugstore, health food store of amazon. VERY interesting blog you have here, especially to this retired organic chemist who, at age 5, had decided he wanted to be a chemist or chemical engineer. My guess is that the toilet bowl cleaner was a basic – high pH – type rather than an acid one. I’ve seen the problem you describe and am fairly sure that is the cause. If it was a drain cleaner product rather than a bowl cleaner, some of those are pretty close to 100% sodium hydroxide. Some types of glass are more resistant to being attacked by bases than others. I remember in the lab, as a student and teacher, that the stoppers in glass reagent bottles would occasionally ‘solvent weld’ together with a basic solution in them. I read this article and every comment with great interest! I then siphoned off the vinegar I had put in the rinse dispenser of my dishwashing machine and replaced it with Lemishine Rinse Aid, VOILE! No more hard water residue/spots on my dishes! Now I am wondering if I could dillute citric acid in distilled water to achieve similiar results. I would love to hear your thoughts on this idea and perhaps even a suggestion on how much water:citric acid you might suggest I try? Thanks for all the hard work with your analysis! VERY HELPFUL! Being just a housewife and no chemist, but looooove to know what I can use instead of Lemishine, because I can’t buy it here in Thailand. Dishwashers are only in the houses of foreigners, so super markets don’t sell much of the dishwasher stuff. maybe I can make it myself if I can’t buy something ready made. The most readily available source of citric acid I know of is lemon juice sold in bottles here in usonia. Of course, it’d carry in unknown components to y’r wash. Perhaps a search of “lemon juice” would tell you what other components are in it. A little late, but In Thailand, citric acid is “groat manow” (lime) or possibly “groat nam som” (lemon). Sometimes with “pong” at the end to indicate “powder”. The Indians use citric acid to make the Paneer cheese, so maybe you can find it at an Indian grocery or shop. In Hindi, I believe it’s called Nimbu ka Phool or Nimbu ka sat. Please reply asap. I accidentally mixed bleach with the lemi shine. I ran a half cycle and drained it out. How bad is this and what should I do?…I can’t find anything about what happens or what you should do when you mix it. It just says don’t mix it!…. Hi! I remember why I had to talk my way out of that course after skimming through all of your efforts here. Good gravy! Question: Do you think that the folks at Lemi-Shine were just word playing? Could it be that Lemi-Shine is citric acid, but they’re telling you “Close, but no cigar” because you didn’t mention the other ingredients that total up Lemi-Shine? If Lemi-Shine’s active ingredient is only citric acid and they admit to it, they would likely lose a lot of business. Honestly, I was doing a search on Lemi-Shine’s ingredients because I need citric acid to make dishwasher detergent, which I don’t have …or do I?. I was thinking that the Lemi-Shine in my cupboard probably is mostly citric acid…. Anyway, I’m going to test in my own way now since I can’t find the ingredients anywhere. I’m going to use straight citric acid in my dishwasher (after I buy some) and see what the dishes look like after they’re clean. If they’re as clean as when I use Lemi-Shine, I’ll conclude that Lemi-Shine’s active ingredient is citric acid. Even if it’s not and the citric acid works on my dishes, I’ll be switching my washing booster. I don’t like that I can’t find what I’m using on my dishes that I and my family eat off of (sometimes lick too). Isn’t there some sort of law that makes it so the consumer is privy to what exactly they’re buying? Most of the replies on here are old; but anyway . . . I’m no chemist, so all that stuff was gobbledygook to me. Made with real fruit acids, natural citrus oils and sodium bicarbonate. Our pavers on the driveway and around the house are new and very attractive; flamed terracotta-white color and “bishop hat” shaped. In certain areas I have noticed the appearance of some stain of unknown origin. The University of Florida says it could be from plants and flowers. The stains can also be from night animals droppings/fluids, but there is no residue on top of the stain. The pavers are made of concrete. So far no one, including pavers experts and cleaner companies, has been able to identify the source of the stains. The stains are also present on a thin walk-on stone that I would be glad to send to a lab for analysis. So far I have been unable to find a lab for this testing. I have also contacted the Indian River State College and the pool cleaner. Any suggestions from any of you? If you can do it, I’m willing to pay for the service. Please advise. I have tried the following remedies, without success: Clorox – bleach (diluted and full strength) – hydrogen peroxide – concrete cleaners – rust stain remover – comet – fabuloso – white vinegar – Lysol – Coca-Cola – magic eraser – baking soda – formula 88 degreaser – ammonia. I’m hesitant to go to muriatic acid. Yesterday night I tried Lemi Shine on a stain and got some partial results. Probably the citric acid component does the trick. Are there stronger versions of citric acid on the market? Which are their names and where to buy them? I’m much obliged to all of you for your advise in identifying the stains and the remedy. Thank you so much. I have issues with dishwasher resistance of organic coatings on glass. The requirement is to pass 10 cycles of normal dish washer cycles. We had a major glass supplier recommend Lemi-shine as the base line detergent. My idea was that the more basic systems would affect coatings more than acidic situation. 1..What would be the action on citric acid with Ca and Mg water hardness and does it cause precipitation? 2..Can we work back and get the weight percentage of citric acid required to get a pH of 2? 3..Can we check with a GLC for any organic detergents such as sodium lauryl sulphate. 4.. What happens if I mix say Cascade and Lemishine on the pH? You are an amazing character, must check your art later. I’m no chemist, I’m just an appliance technician. I’ve seen every make and model made since the late 70’s and they all have 1 thing in common – the number one complaint, doesn’t clean my dishes. Dishes are spotted, dull, detergent won’t dissolve, detergent left on dishes or in dispenser. With that said, think about how many people pay for a service call? Then add the diy’ers. A lot of money is spent either way. First thing we do is try to save money and $5 for a box of magical cleaner is a lot less than a service call. Detergent companies love to sell detergents, and they sell a lot. But if it works so good why do I still get the same complaints from people that use Lemishine, Cascade, Jetdry etc? The answer is in your owners manual and on the detergent lable. The water tempature needed to dissolve the detergent. Newer dishwashers use less water. All have several fill then drain cycles. Your thinking, “I know my water is hot”.Is it? Start your dishwasher, listen for the water to fill, when it stops filling with water open the door and take the waters tempature. If it’s not the desired 120* there’s your problem. Most dishwasher fill several times before the detergent door opens. Detergent likes to stick together in cold water. If the1st fill is cold, then the detergent is too. if you use a rinse aid, you are combining more chemicals then adding LemiShine a citrus acid, or so they say, you have all that in your dishwasher and without the proper water tempature it will cause problems, I promise you it will. Your dishwasher may smell n look better…for awhile. I said in the beginning, I’m not a chemist. I don’t know what all those chemicals are doing mixed together in water that’s not hot enough for them to dissolve but what i do know is what I’ve seen: excessive sudsing. The door gaskets aren’t designed for suds and neither are pumps. Pump impellers create suds, suds cause gaskets not to seal and pumps can’t pump suds out so we have a confused dishwasher n you have a bigger mess than just spotted dishes. I’m not saying that every complaint is caused from low water temp. I’m saying “Be smart” Read your owners manual. You might find the answer to “why does my dishwasher and disposal smell” then you can quit buying all those chemicals n citrus stuff. Be smart! Read! Inform yourself. We recently moved to a different city. My dishes are white. The dishes that go through the dishwasher the most often now have an iridescent film, similar to gasoline on water. Vinegar doesn’t remove the film; neither does Windex or rubbing the dish with a cut lemon.. I read the owner’s manual, did a “vinegar run” with clean dishes in the machine, but the film did not come off. I will ask around, see if this area has hard water. Plus I will do another “vinegar run” through the empty machine. Citric acid, that’s ok for the environment right? I’m not a chemist and so while I admire the work you put into testing Lemi Shine the thought of slogging through it makes my eyes glaze over. The end result, are we substantially hurting the environment using this product? Thank you! This was awesome. Lemi Shine works so well, I was worried I was dumping something horrible down the drain. Now, I add it to my tea. Honestly it smells like the coating that’s on the outside of sour patch kids. This thread is old but fascinating. I was reading this for pure interest. I am not a chemist nor chem major but enjoy reading since I like to DIY. Just wondering if perhaps if it could be fumaric acid? I noticed the kool aid unsweet powder I was using to make homemade dishwasher detergent (1 packet unsweet koolaid to 2 cups melted vegetable soap with about a cup of homemade washing soda plus filtered water)….once contained fumaric acid for a while. I looked it up, and fumaric acid is an industrial cleaner (solvent?) that is lighter in weight than citric acid. But I’d have to use about 10 packets ($1) or so to equal amount of LemiShine used in each dishwasher load, and the Lemishine bottle seems a much better deal. It’s also lightweight and granular. I wonder if it indeed has both fumaric and citric acid and some sort of inert filler for volume plus the obvious essential oils? Just curious. Thanks. Unsure if fumaric acid , which is also obviously food grade, would yield same results. It may well be the other active ingredient. If it contain both isomers then it would have two scented compounds and one of them has detergent properties. This may be why the manufacturers were coy about admitting that it was just citric acid. The hydration level of the acid could also account in part for the variability of the formula in the MSDS though these are vague even if the ingredients are very simple. Could it be natural ascorbic acid instead of synthetic citric acid? My pool man was shocked that I knew that the stain remover for white fiberglass steps was just Vitaminwater c ascorbic acid. I know vitamin c removed Tania acid stains, so I just crush up some vitamin c tablets and apply with a sponge. Like magic, Tania acid stains, from leaves, disappear. Could it be natural ascorbic acid instead of synthetic citric acid? My pool man was shocked that I knew that the stain remover for white fiberglass steps was just Vitamin C ascorbic acid. I know vitamin C removed Tanic acid stains, so I just crush up some Vitamin C tablets and apply with a sponge. Like magic, Tanic acid stains, from leaves, disappear. SPELL CHECKER MESSED UP FIRST COMMENT. THIS IS A REDO.